For a long time, vegetarian advocates have been making the case for a meat-free diet by saying things like, “It is easy. Even 7-11 snack pies are vegan!” Yes, there are a lot of accidentally-vegan foods like Oreos and Cap’n Crunch. And with vegetarianism becoming increasingly mainstream, big brands like Kraft and General Mills have jumped on the bandwagon and began making vegetarian foods like mock meats. But, just because something happens to be vegetarian or vegan, it doesn’t mean you should eat it!!! A lot of our favorite vegetarian fallbacks are actually loaded with disgusting, unhealthy ingredients. Considering how much we like to play up the health benefits of vegetarianism, it would be good of us to acknowledge the crud we are putting in our bodies when we eat veggie crumbles or the latest flavor of soy ice cream. There are too many unhealthy vegetarian products out there to list them all. So, I figured I’d start with these popular ones. 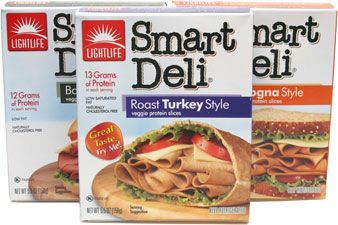 I love fake meat products like Gimme Lean sausage crumbles and LightLife’s Deli Slices. They make it incredibly easy to throw together a vegetarian sandwich or find a substitute for a recipe which calls for meat. But there is a dark side to these fake meats. Soy protein isolate and textured vegetable/soy proteins are made with a scary chemical process which involves a neurotoxin called hexane. Hexane helps extract the protein from soy so it gets that meaty texture. Hexane is also used to extract oil from soybeans. Hexane is a byproduct of gasoline refining. The Center for Disease Control and Prevention has classified hexane as a neurotoxin. In large quantities, it can cause serious nerve damage. Hexane use in food manufacturing is currently not regulated by the FDA. Hydrolyzed vegetable protein involves an additional step. The protein which was extracted using hexane is then boiled for days in hydrochloric acid and then neutralized. As a result of this chemical process, one of the protein’s amino acids becomes glutamic acid, which you probably know better as its salt form monosodium glutamate (MSG). So, those vegetable proteins essentially become addictive flavor enhancers. ***Note that not all fake meat products use these chemically-produced unhealthy ingredients. Tofurky is one brand I am happy to say has healthy ingredients. Tofutti makes a lot of great products – but I’d recommend steering clear of their Original Plain Cream Cheese. After water, the first ingredients are partially hydrogenated soybean oil and isolated soy protein. Hydrogenated oils are oils which have been pumped full of chemicals to change its physical state. The resulting oil is thick and contains traces of substances like aluminum, nickel, or platinum. The oil is so thick that it even makes our blood get thicker, making your arteries get clogged and causing your heart to work harder. Luckily, Tofutti also makes a non-hydrogenated version of their cream cheese. This version also doesn’t have any isolated soy protein. I used to buy granola in bulk, so I never really looked at the nutritional stats. So, I was surprised to find out that a typical bowl of granola actually contains more sugar than a can of coke! Now, I make my own granola so I can control the amount of sugar in it. If you don’t have time to make your own granola, at least read the nutritional facts and ingredients on the granola you buy so you realize how much of a sugar bomb you are getting! Just because soy ice cream is vegan, don’t mistakenly believe that it is healthy! Soy ice cream is as loaded with sugar as the mainstream brands of ice cream. After all, evaporated cane sugar is still sugar! A lot of these soy ice creams also use the “unhealthier” forms of sugar like corn syrup solids. Plus, the soy in the ice cream is often GMO. Just because you are a vegetarian, it doesn’t mean that you don’t have to worry about excessive sodium consumption. Lots of vegetarian food products are loaded with sodium – especially all those canned and instant soups we love to eat on the go. For example, 1 can of Amy’s Organic Black Bean Vegetable soup contains 1240 mg of sodium – or 83% of the RDA for sodium! This is one just more reason to make your own soups instead of relying on those instant, manufactured products. Make a big pot and then freeze it in individual to-go cups so you will have healthy, low-sodium soup whenever you need a quick eat.